In the wake of corporate crisis impacting business and society in the last decade, experts insist that the investor drive for increasing quarterly profits has twisted the decisions made by public company executives. It is this profit maximisation focus that has led to an increase in short termism, and it is the company’s long term value that is suffering. According to a study of the turnover of the S&P 500 companies, around half of the S&P 500 will be replaced over the next decade, as covered in our recent blog article What intelligent machines can tell us about emerging issues. Integration of ESG issues into corporate strategy is a prerequisite of undergoing that shift from short-termism, to a focus on long-term value. Central to this debate is the fundamental question of how capital markets can incorporate research that validates the causal relationship between corporate performance and ‘good ESG’. “Firms with better ESG ratings experience higher credit ratings and lower cost of debt. This is due to their being better equipped to manage risks that directly impact their business activities in the short, medium and long term”. According to Van Dyke, there is growing measurement of ESG issues across the financial sector because ESG criteria can help to evaluate risk, team productivity, efficiency and sustainability. Indeed demand for ESG investment strategies is on the rise, with a 68% increase in ESG assets between 2005 and 2016 (Source: US SIF’s report on US Sustainable, Responsible and Impact investing trends) in 2016. Furthermore, according to Bank of America Merrill Lynch (BofAML), investing in companies that incorporate a good level of ESG could have avoided of 90% of bankruptcies seen since the 2008 global financial crisis. Additionally, BofAML research suggests that 90% of millennials already engage in “impact investing” or want to…This group alone could drive $15-$20tn of inflows over the next two to three decades, roughly doubling the size of the US equity market (Bank of America Merrill Lynch, Dec 2016). “market analysts are operating with a data deficit when attempting to extrapolate some specific areas of ESG performance during their assessment of a public company for their investors”. He argued that in many companies there was a gap between the relationship between corporate values and ESG within company materiality processes. Indeed, this was confirmed in December by MaterialityTracker in an evaluation of what companies said were their material topics in the Dow Jones Sustainability Index leaders’ Annual Financial reports, and what they were discussing in their Annual Sustainability reports. Read the article here. In order for investors to ask the right questions about ESG and value creation, they need information about a company’s performance with regard to ESG practices. In short, they need data, and lots of it. However, traditional metrics are sparse and inconsistent, and the rest of the available information is qualitative and found in unstructured data. According to the International Data Group more than 80% of data is unstructured and finding ways to navigate the large amounts of data required for investment decision-making, needs technology that can effectively organise and make sense of it. And that’s where a platform like Datamaran can really come into play. Cloud based software technologies are on the rise, 85% of business leaders believe big data will dramatically change the way they do business in the future, and 80% of all enterprise reporting will be based on business intelligence and analytics by 2020 (MNP). With smart technology data analytics like Datamaran – specialising in ESG analytics, analysts now have easy access to large data sets on non-financial issues, including corporate annual reports, SEC 10-K and 20-F filings, annual sustainability reports, regulatory initiatives, online news and social media, so the process of undertaking an in depth materiality assessment is now arguably far easier – and simultaneously more robust – than it was previously. Datamaran is a tech startup moving into its fourth year of growth. Our proprietary database has been recommended by experts, and is being used by many of the top fortune 500 companies. Our CEO, former GRI Director, Marjella Alma, recognised the problems facing businesses in monitoring and reporting on risk, sustainability and ESG issues, and decided to take action. 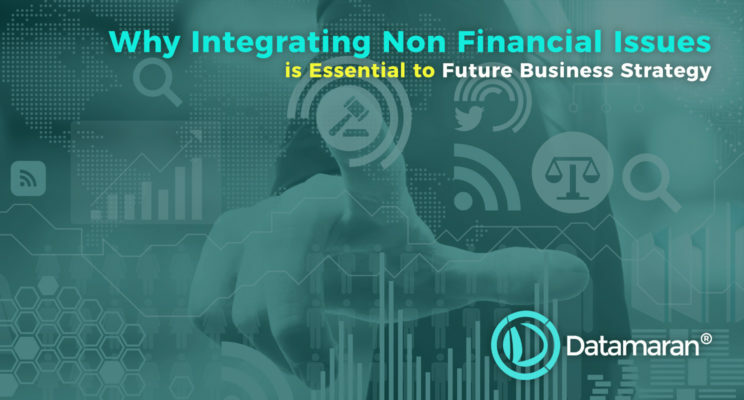 Together with former Wall Street Quant specialist, JP Lecourt, and former Technology and Analytics consultant, Jérôme Basdevant, they formed Datamaran, and began work on creating an Artificial Intelligence tool that would provide fast, efficient and powerful business intelligence on large unstructured datasets from the global corporate reporting landscape. Our vision is a world where investors, public and private sectors integrate non-financial issues into their decisions for better results. We love hearing from people who are interested in long-term value creation, and would be happy to give a demonstration of our award winning business intelligence platform to anyone interested in learning more.